We woke up at 6am at our farmstay and packed up the van – being first timers at campervanning every took longer than necessary. After tip toeing around for thirty minutes trying not to wake up other campers we were soon on the road for our second excursion, a 9am tour of Hobbiton. 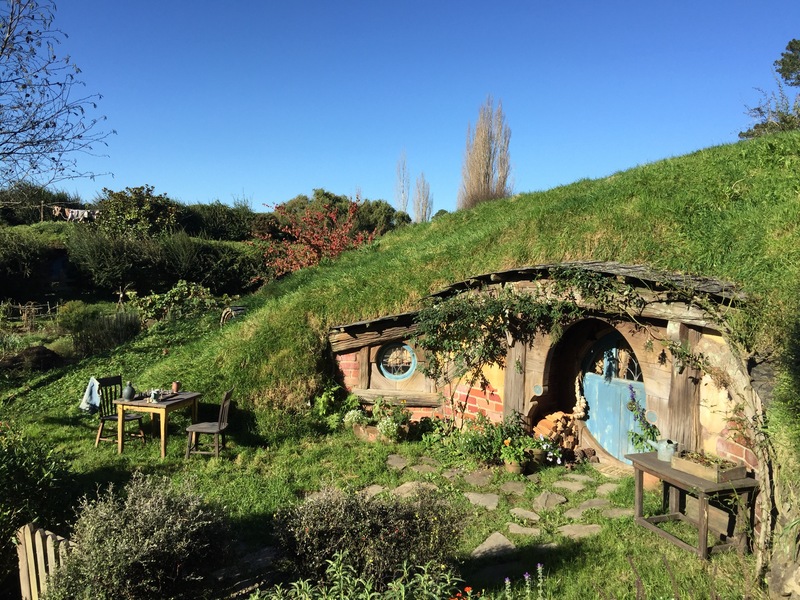 Under spectacular sunshine and blue skies the New Zealand country side offered fantastic views of rolling green fields, it was easy to see why Peter Jackson had chosen the area for Hobbiton. We rolled into the car park at around 8am, leaving enough time for a quick bowl of cereal before checking in for our tour. As we boarded the bus for the short ride across the road to the movie set, we saw we’d left the van lights on – queue a nervous few hours on the tour, wondering whether we’d get back to a flat battery! A short video on the bus with the iconic ‘Lord of the Rings’ soundtrack and we were excited. As we disembarked and made our way into the first section of the iconic set, one immediate observation was that getting on the 9am tour was essential for a good photo – by 10am there were hundreds and hundreds of people blocking every shot, whereas we had at least 20mins with the whole park to ourselves. The level of detail was remarkable. All vegetables and fruits were real and it was astonishing that most of it never even made it into the film or for just fleeting seconds. 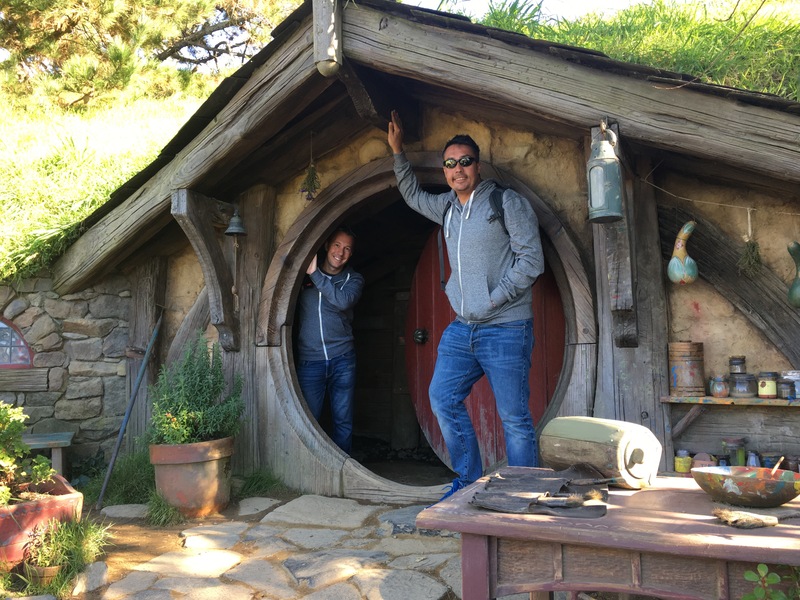 The tour itself lasted about an hour, taking in all the famous sights from the six ‘Hobbit’ films – wandering past forty plus of the famous round Hobbit house doors including Bag End, home of Bilbo and Frodo Baggins. The tree above the famous hobbit hole was one of few fakes. It you wouldn’t know it. 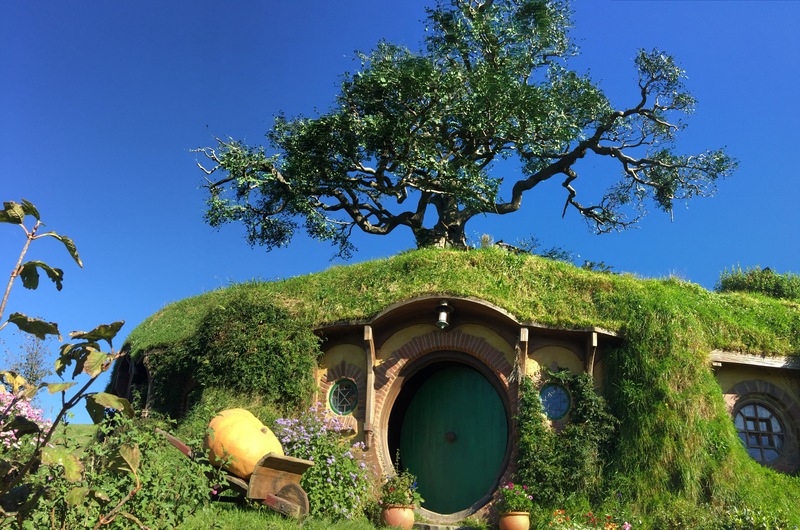 The set itself was demolished after the original Lord of the Rings films were filmed in the late 1990s, but was permanently rebuilt for the recent Hobbit trilogy. The new set keeps all the attention to detail, although only for a front facade – the interiors are all empty concrete, with internal scenes having been shot in a studio. The impeccable grounds are maintained by a staff of over forty. 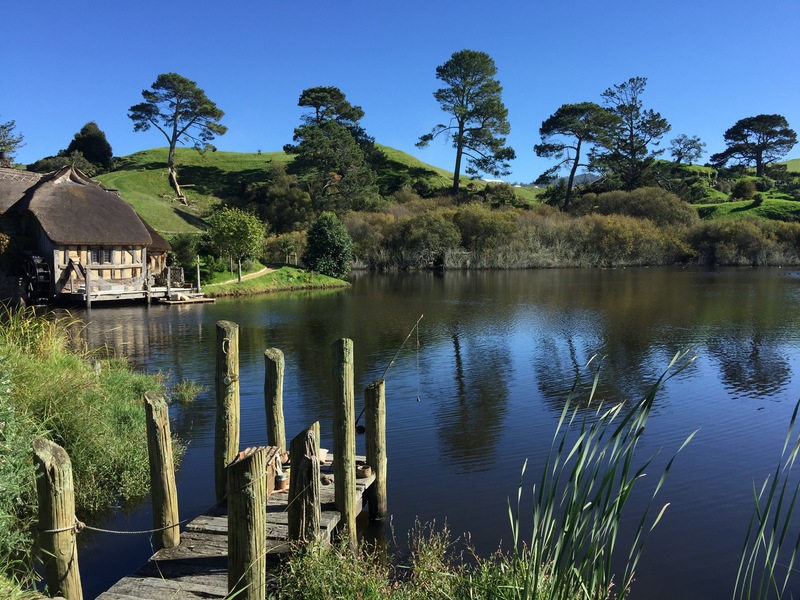 After countless photos around Hobbiton, it was time for a pint of Cider in the Green Dragon pub on the edge of the lake. After enjoying a drink next to the roaring fire it was time to head back to the van. 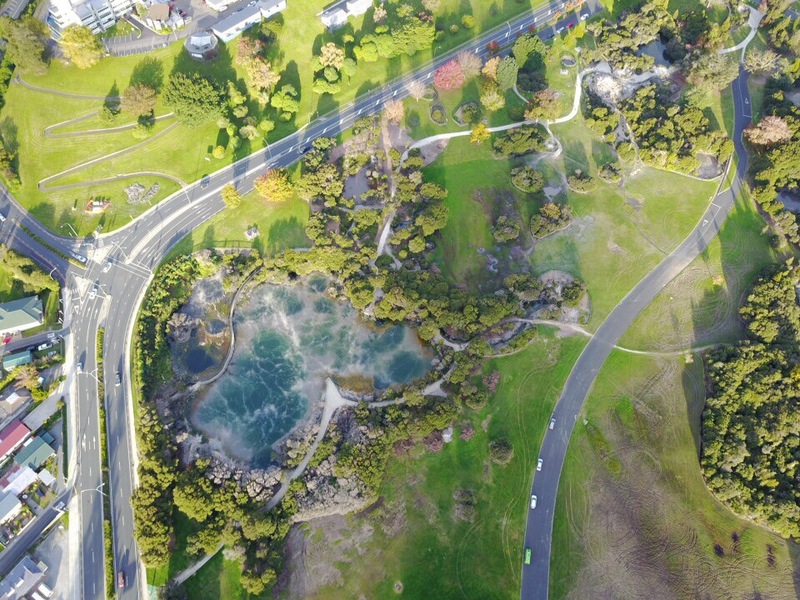 Once checking that the van was still running, we sent the drone up but extreme technical issues and interference suggested they had some form of drone blocking system, so we packed up and hit the road for Rotorua. The drive to Rotorua took around two hours but after an early start we were in need of a nap – the only place we could find to pull up was alongside a park. After a quick nap we ventured out to explore some of Rotorua, including the famous thermal hot springs, a series of bubbling and boiling sulphur mud pools. The smell of sulphar filled the air and it was quite off putting. With most of our electronics running on empty we decided to check in to a powered campsite for the night to recharge and relax. Using CamperMate, an app that had been recommended to us we booked into a local holiday park. Although relatively expensive at $38 for a bay, it was nice to have somewhere to park up and with cooking and toilet facilities. 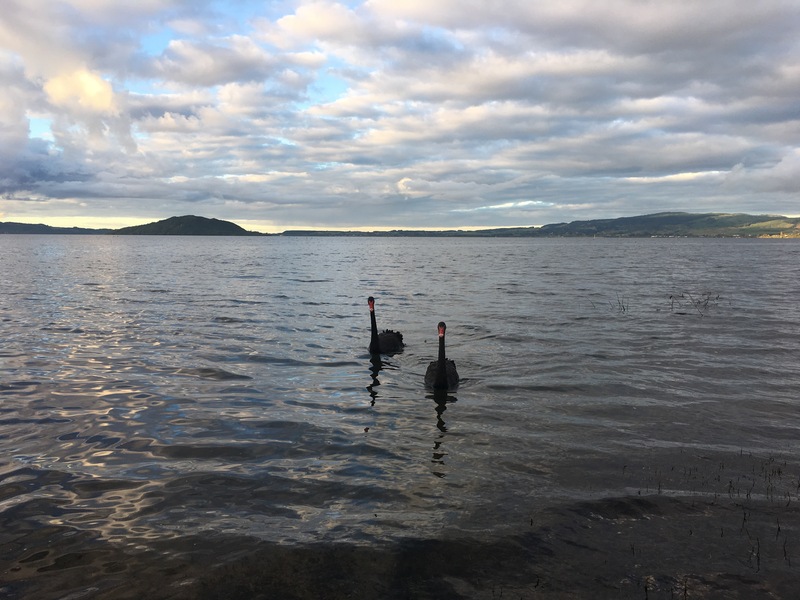 While Jamie prepped dinner, it gave me another chance to fly the drone over the thermal springs and get some photos of Lake Rotorua. Jamie took a walk to the lake and discovered our campsite also sat on several bubbling springs which explained the smell. Electronics charging, bellies fed we watched a film on the laptop and got some rest for a busy day the following day white water rafting! !